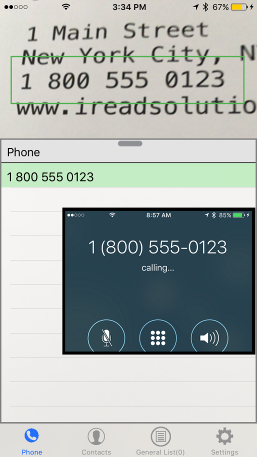 VisuCaller is one of iRead Solutions Inc. 'Apps With Vision' designed to scan and work with contact data. VisuCaller scans contact information and allows you action the scanned information (call a phone number, get map directions, browse a website, initiate an email). When operating in the tab designed specifically for phone number, phone calls can automatically be initiated when phone numbers are detected multiple times..
A viewfinder is used to enclose contact data to be scanned and detected information is displayed in a list. If a data is detected multiple times in succession, the App will highlite it in green giving a visible indication of data that is more likely to be accurate. 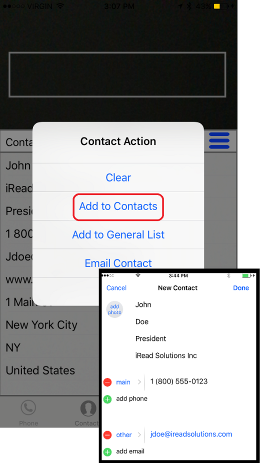 You can edit scanned data to correct errors or add data, such as add prefix codes for phone numbers.